Making and keeping New Year’s resolutions is NOT my strength, so I don’t do it. 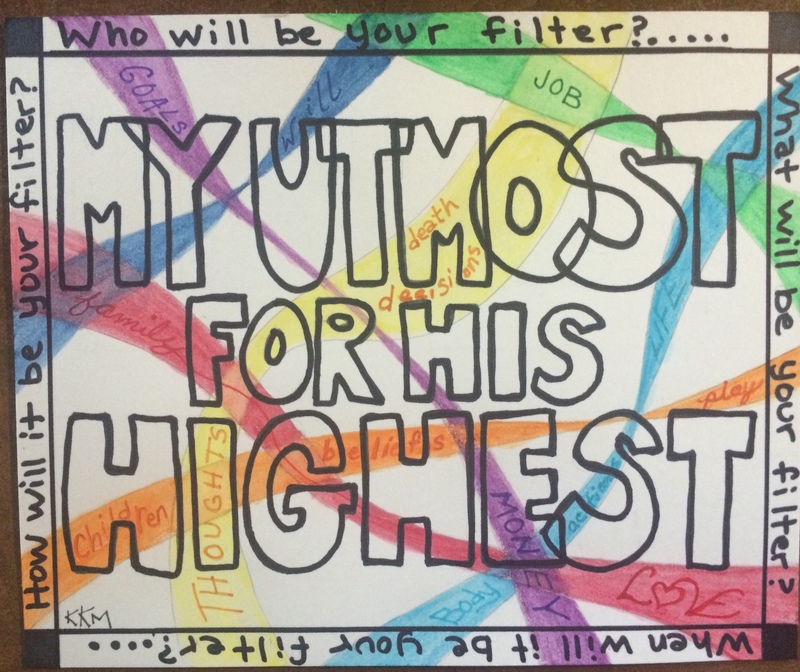 However, as I thought about this mornings devotion by Oswald Chambers, I was reminded that it’s not the individual resolutions I need, but a new filter system. So as I enter in to 2015 my only resolution is to run everything through this system…no matter the cost. Whew, I get flutters in my stomach and a lump in my throat just thinking that thought and writing it down. Why is it so hard to trust my creator with my life? As you can see, I’m not off to a perfect start but that’s okay, I’m yanking my thoughts back around and placing them in His hands to work out in me. Trusting God may cause willies in my stomach from time to time but I’m choosing to think of it as a roller coaster ride. I’m a thrill seeker for Christ and planning to enjoy the ride. Who’s with me? P.S. It’s okay to scream once in a while. 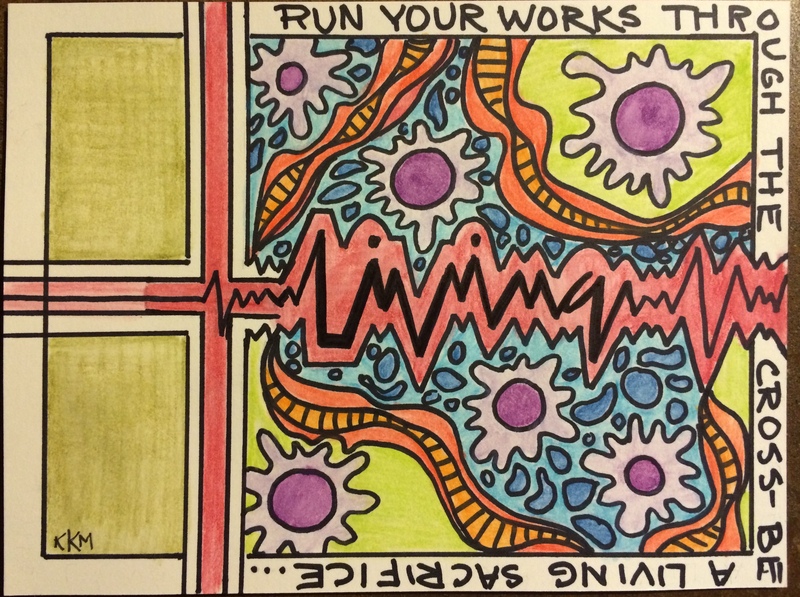 Doodle #83 for January 1, 2015. I can’t add a thing here. Have a great day! This is a rough sketch…but hopefully understandable. The point is, to really understand and experience God’s word requires more than a casual, ho hum, approach to God….as if he were just your everyday acquaintance or sugar daddy to be used and trampled on. To fully understand God’s words is to enter into an experience. There’s an energy to His words unlike anything else, but they have to be entered into through Jesus Christ, and a born again experience. Then His words will have a power and a life like never before. They are LIVING, invigorating words. 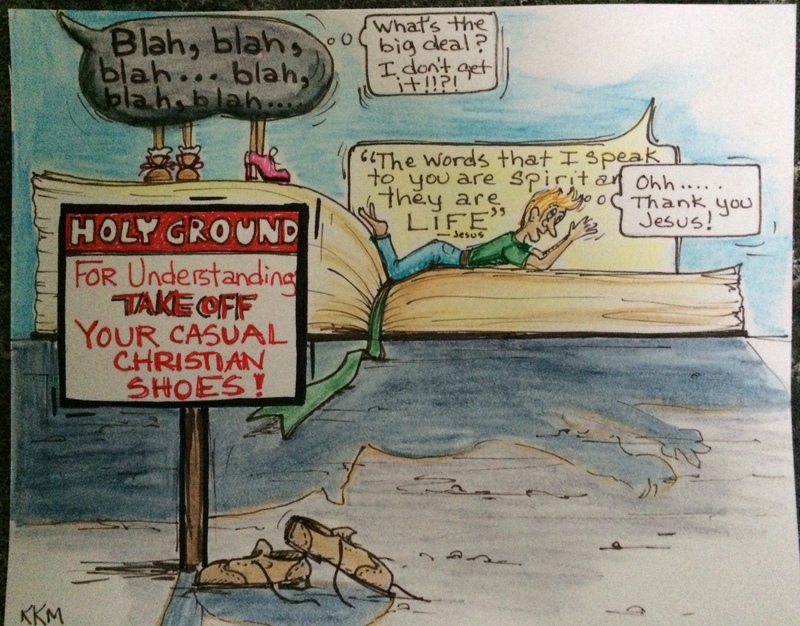 If all you’re hearing or feeling when you approach God’s word is a dark cloud of “blah, blah, blah….”, check yourself for a casual Christian attitude. If you’re not serious about God he can’t be serious about you. Doodle #85 for January 3, 2015. There are times when waiting is inevitable and obvious, doctors appointments…first in the lobby, which usually comes with a People magazine. This is an opportunity to catch up on the gossip, good or bad, and be reminded about how blessed you are to be a nobody. Then you get to go into the inner sanctum, your examining room, and wait some more. This time however, you are instructed to strip down to your birthday suit and if you’re lucky, given a thin cloth “gown,” instead of the crunchy paper “gown” that seems to insist on leaving something exposed no matter how much you tuck and pull, while your perspiring behind is sticking to the protective paper you’re required to sit on. You are fully exposed and vulnerable and the only source of entertainment (if you’re lucky) is reading the anatomy posters hanging on the walls or staring at the tools with which you are soon to be examined. I am speaking here from a woman’s experience, we usually behave ourselves while waiting…men on the other hand see this as an opportunity to play with new tools…..but those are whole different stories. Just like your first real doctors exam where your nerves are especially on edge, really waiting on God for the first time can be even more nerve wracking, especially when there is much on the line. But with each experience it gets easier, yes, it’s still uncomfortable. However, each time God delivers something you could never deliver you begin to realize that WAITING on the Lord and His outcome is way better than jumping ahead and screwing things up, then having to ultimately wait on Him anyway, but this time he has to fix an even bigger mess. 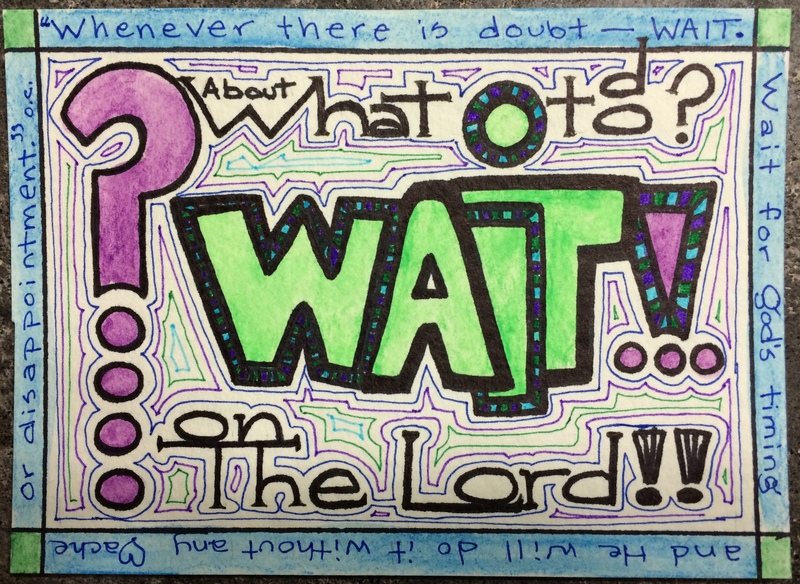 Wait on the Lord, be of good courage….be still. If you feel like a failure…you’re at a good spot. Receive His forgiveness and His Spirit and walk in newness of life. For January 5, 2015, #87. There was a time in my life that I lived in two worlds, a sacred and a secular. 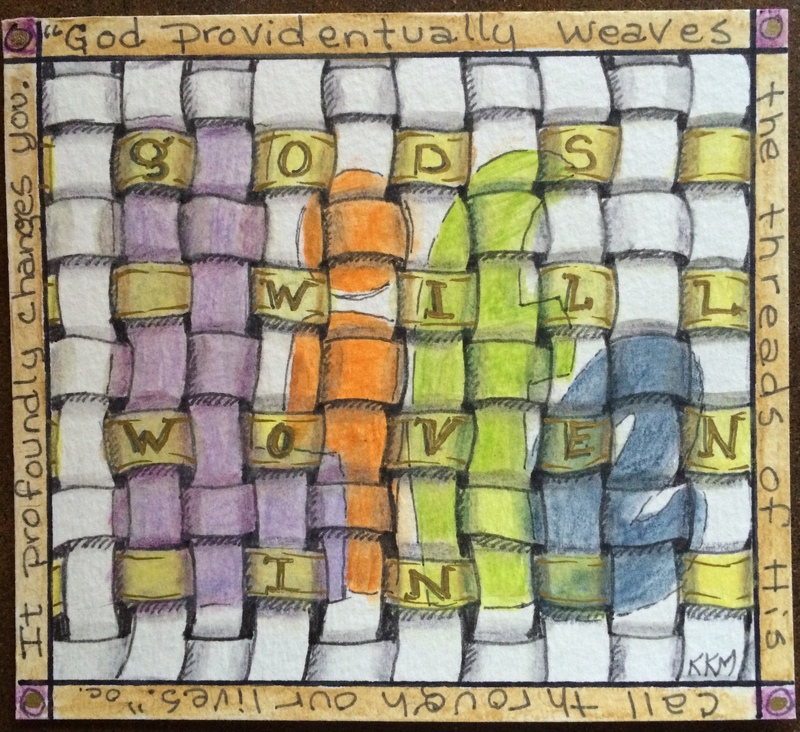 I had a certain day that I REALLY worshiped, when I thought God was more present and available, and there were certain things and places that were sacred or “worldly.” The two could not commingle in my mind. Have a great day! Doodle for January 6, 2015, #88. I’m sure at one point in your life you have said to yourself, “If only that person (fill in the blank) would be my friend, life would be so good.” Only to discover that “that person” wasn’t so nice and rather than life being good you now question your standing in life even more. 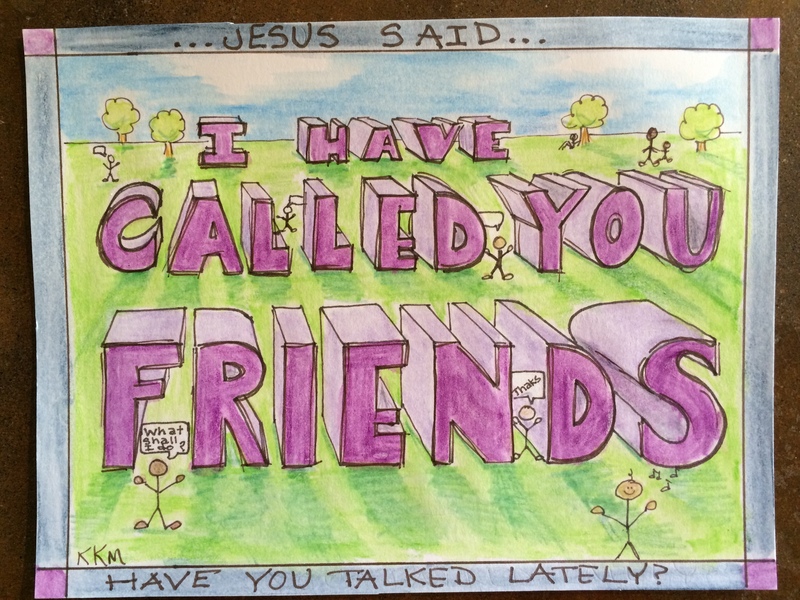 There’s only One who will call us “friend” and be a true friend and that is Jesus Christ. All we have to do is take Him up in the offer. He’s available 24/7/365 and best of all, He leaves you feeling more confident, calm and productive. Start up a conversation, walk with Him and see where it goes today. (Don’t forget to stop and listen in return). Doodle for January 7, 2015. #89. All our works before the cross are just flat lining. Need I add more? Just think about it….everything has been provided for us!! 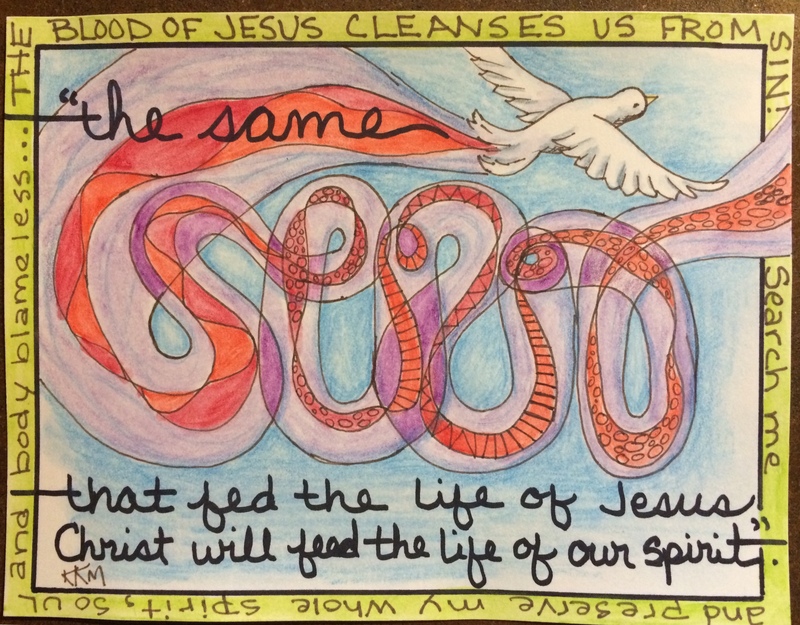 Jesus’ cleansing blood and the Spirit that fed and preserved Him, all flowing freely through our spirits, scrubbing out the plaque of sin and preserving us for all eternity. And it’s a gift…just waiting to be accepted. Have a blessed, Spirit filled day. Had any See Food Recently? Receiving something is an admission that we need something….there’s dependence on someone for that “thing.” There are varying degrees of need in all cases accept with salvation and the power over the sin in our lives. There is not one person who is higher on the “ready to be saved” scale than another. In fact, Jesus dealt most harshly with those who thought they were ready to be saved (in need of nothing-could discipline themselves to look and be good) and hung out with those who felt no pride of accomplishment–they were “sinners” (recognized their need). 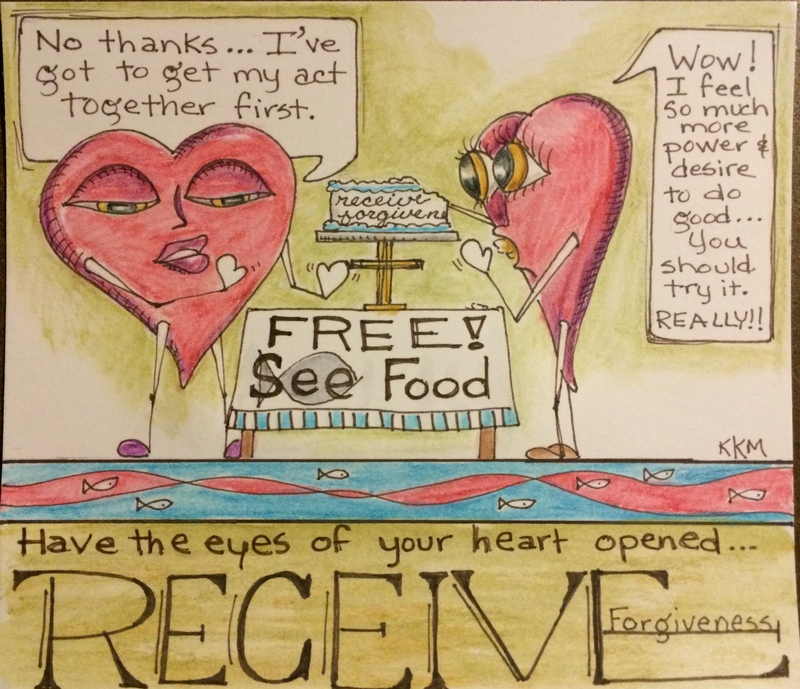 Forgiveness is “FREE” to us (but it cost God everything…His only Son). I say it’s “free” because it does cost us something, our pride. We have to admit that we can’t do even what we want to do because we are broken through and through. We are sinners in need of a savior. Once we can admit that, we can receive forgiveness and the power of God for salvation. You can call yourself a Christian but if there’s no power in your life I’d wonder, have the eyes of your heart been opened to who you really are and what you really need? Get into the “stream” of power, the blood of Jesus Christ…receive His forgiveness. Every decision we make has a consequence in us and others, but when you throw God in the mix it gets even more complicated. 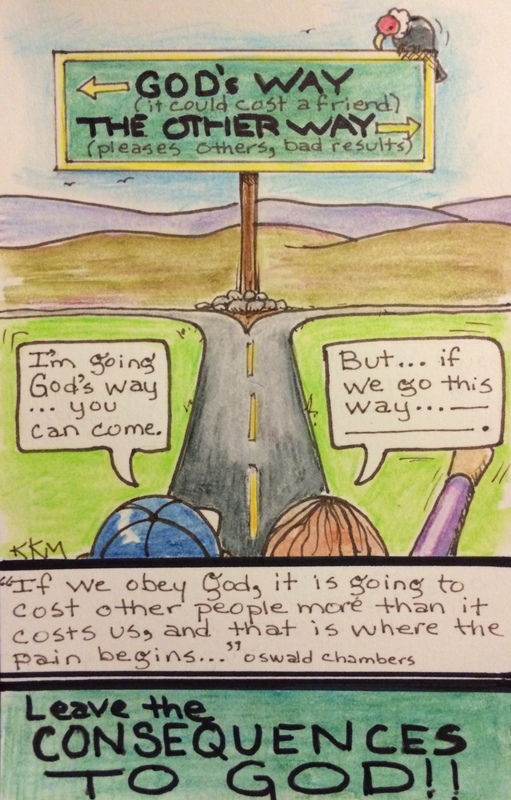 Often as Christians we’re lead to believe that if we compromise the direction we know we should go for the sake of another, that possibly we will “win” them to God. Sometimes though, it is a matter of even spending time with God at the expense of time with another or a matter of doctrine, that we are tempted to compromise on. So the battle for which way to go begins. This is your personal battle and you know your circumstance, but if it is the difference between a relationship with God and obeying His word or another’s….the choice is obvious. God WILL take care of the consequences…He loves the other people in our lives as well and He’s dealing with them in their own individual way. Be true to the calling God has on you and He will work all things together for the good. Every time I do a doodle, by the time I’m done I say to myself…”Does this make sense?” Sometimes I say “nope, but it’s done, so this is what we’re stuck with.” This morning is no exception. Because I am an artist and “see” what people say rather then “hear” them sometimes. I live in an ever changing “movie” in my head. Today, as I was reading about how little we really know ourselves and how slow the process is for God to be able to show us who we really are, (because we can’t learn who we are without having some other things revealed, which reveals other things, etc. ), I saw a snail crawling through the letters of our soul, pushing dirt in front of it, (a rather serene picture), then I saw a more violent picture of the heartache and disappointment we have to suffer to get to the bottom of ourselves. Finally, I saw a well digger, (not as serene as a snail) digging a well, making our “dirt” useful. In this picture there was the strata of the earth and I imagined our souls as dirt, but there were all these layers of different kinds of dirt that the digger had to go through. 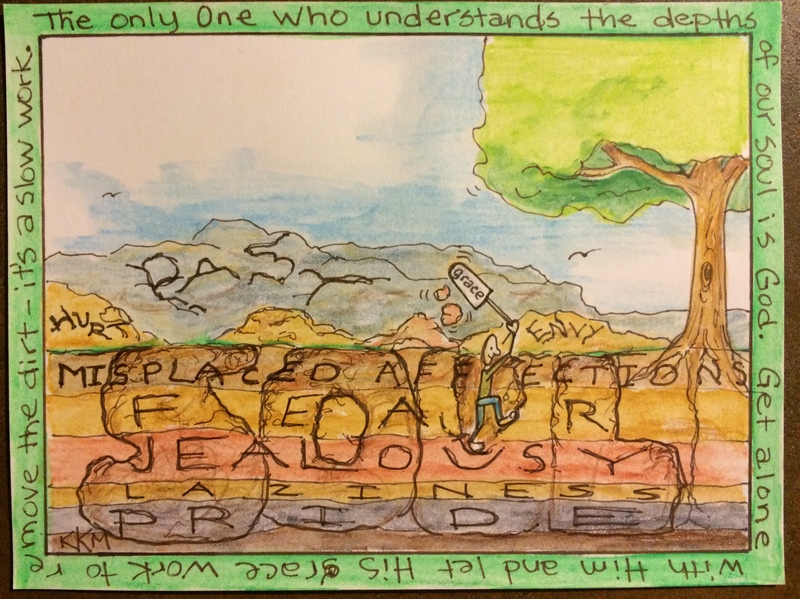 Each layer or sinfulness dug out of our soul revealed yet another layer to be dug. I also “saw” that it wasn’t me doing the digging. It had to be the Grace of God, because if I was doing the digging everything I’d have dug out would eventually just cave back in on myself and I’d be a discouraged, dirty mess. So, we’re stuck with dirt today, but I’m okay with that now, because that’s what we are. 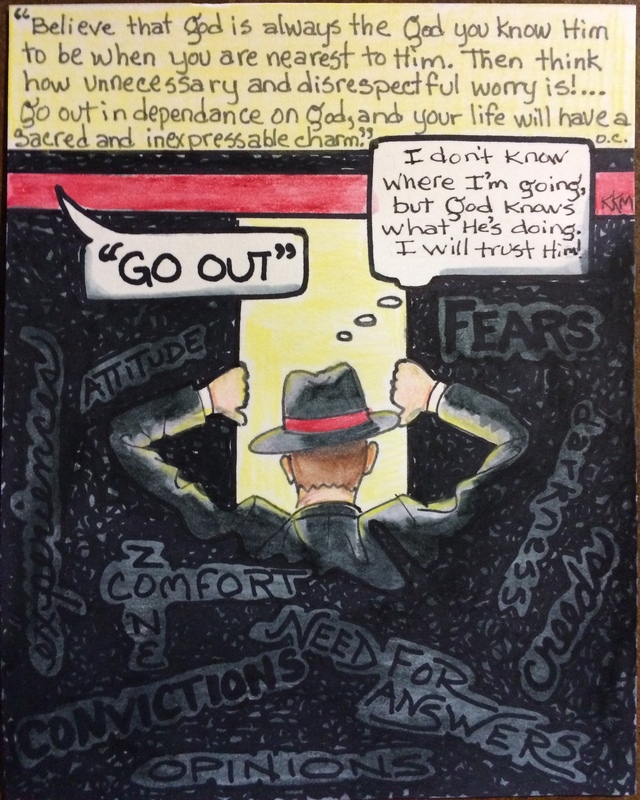 The key point for me today, in my devotional time was this….get alone with God. Let Him dig up the “dirt” in my life. Yes, some layers of dirt will be harder to remove, but He’s a patient God and He won’t stop till He’s come to the bottom of things and all that is left is a deep well where the healing waters of the Holy Spirit can freely flow and where others can come to receive healing. I will be usable. Start digging God. Have a great day everyone. The blog is being built and I’m hoping tomorrow morning it will be “live.” It should for sure be up Tuesday. Pray for me, I’m an artist, not a technical wizard. This doodle is for January 12, 2015, #94. I don’t need to say anything here. We’ve all been there…carpet torn out from underneath us, speechless. 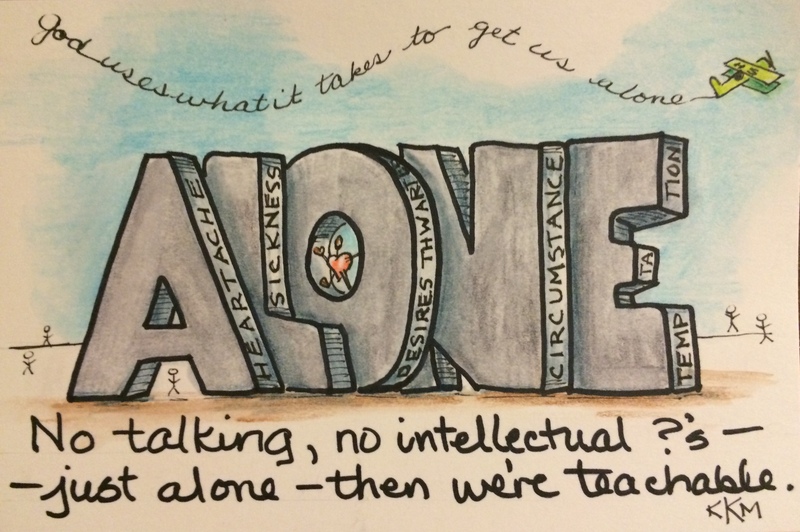 But it’s okay, you’re at the center of His will…finally able to be alone with Him, listening to Him….ONE. Doodle for January 13, 2015, #95. These and several others who have passed in the last couple years, have left a void that will never be filled. They are missed. Death to ones self is no different. It is unnatural!! We don’t strive to die. Instead God keeps walking us back to our “death bed,” hand-in-hand, reassuring us there is something better in store….ETERNAL life. Sometimes it takes years for us to die. We’re willing to “suffer” because we’re afraid of the other side…where we no longer live but where Christ lives in us. 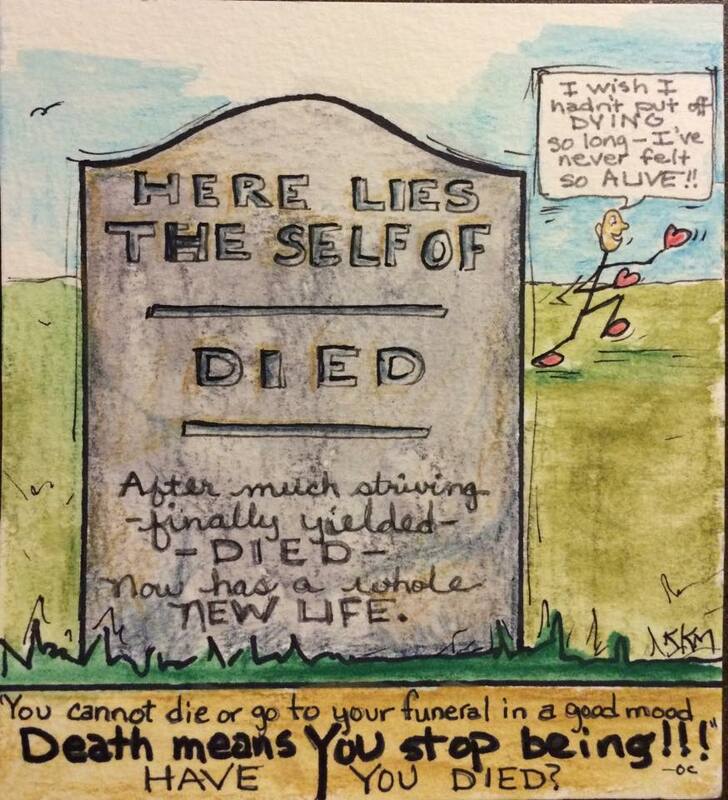 It’s not until we finally yield and die that we realize the “void” we had lived in all along. We are now truly alive. The old self is left behind, buried, never to be visited again. This is one death we should not put off or fight against. Doodle for January 14, 2015. #96. No message here….I had been working on getting this blog up. Wow, I am so glad I found your blog. 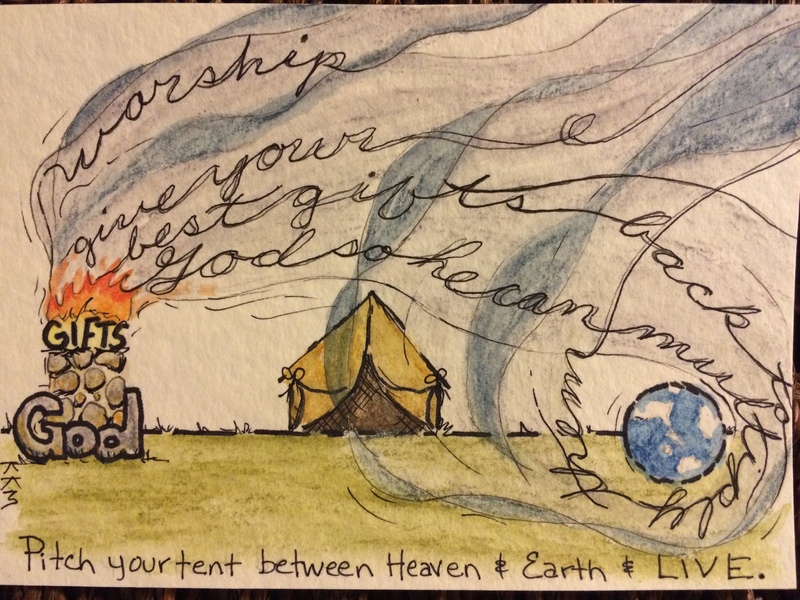 I sometimes doodle my devotions, too. Hi Breezie (if that is your name I love it–I have a granddaughter named Brezi Summers), I’m glad you found me too. I won’t be doing many posts on this site this year as I doodled all the way through My Utmost For His Highest last year. But I am keeping the site up and will be posting once in a while. 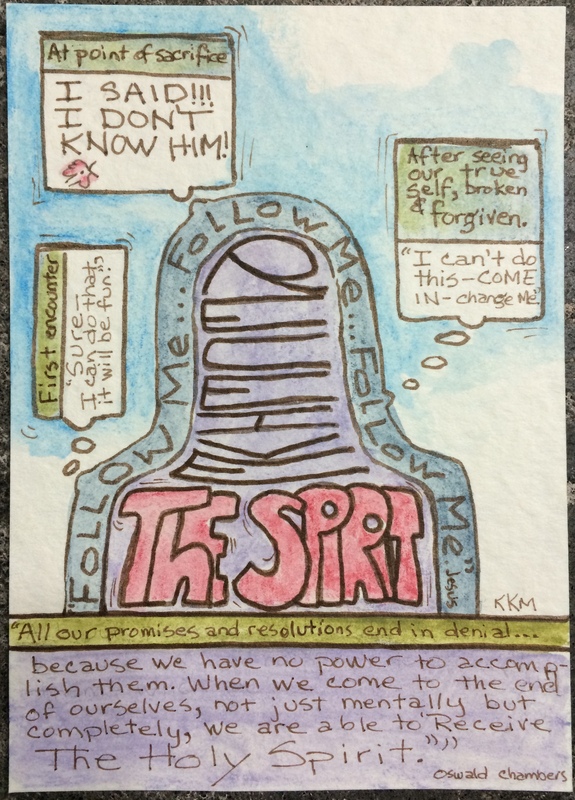 There is a doodle for each day of the month though, so please continue to visit the archives and most importantly, keep doodling your devotions–it changed my life and it can change yours. God bless and happy New Year!